Once again I have let the blog lapse for over a week. As my buddy Ryan will point out, it is becoming more of a ParadoxMonthly than it is ParadoxDaily. However, I have had a busy busy week! My man got home from Iraq and I had to spend some time smooching on him, and then I got hit with an almost deployment myself, and then today found out that it was a no go. Good thing, too. I would have had 3 days to get out of my lease, move out of my townhouse, store my stuff, and outprocess. Not fun. But here I am, back on the beat, ready to inform and titillate you with my fascinating commentary. Unfortunately, politics have been a little boring lately. Most headlines are proclaiming today that Roland Burris has indeed been confirmed as a U.S. Senator, taking Barack Obama's Illinois seat. Whoop-de-doo... a sitting governor appointed a Senator and he was seated. Yawn. I did manage to find two fun things though. First, Sarah Palin got in on John Ziegler's upcoming documentary "How Obama Got Elected" and threw some punches at the media for their handling of her coverage as opposed to that of Caroline Kennedy. Couric: You've cited Alaska's proximity to Russia as part of your foreign policy experience. What did you mean by that? 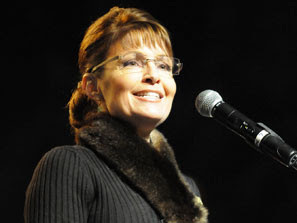 Sarah Palin: That Alaska has a very narrow maritime border between a foreign country, Russia, and, on our other side, the land-boundary that we have with Canada. It's funny that a comment like that was kinda made to … I don't know, you know … reporters. Couric: Mocked? Palin: Yeah, mocked, I guess that's the word, yeah. Couric: Well, explain to me why that enhances your foreign-policy credentials. Palin: Well, it certainly does, because our, our next-door neighbors are foreign countries, there in the state that I am the executive of. And there… Couric: Have you ever been involved in any negotiations, for example, with the Russians? Palin: We have trade missions back and forth, we do. It's very important when you consider even national security issues with Russia. As Putin rears his head and comes into the air space of the United States of America, where do they go? It's Alaska. It's just right over the border. It is from Alaska that we send those out to make sure that an eye is being kept on this very powerful nation, Russia, because they are right there, they are right next to our state. Caroline Kennedy's Columbia law degree, incredible philanthropic efforts, and two books on civil liberties (co-authored with Ellen Alderman) more than make up for her, uh, ya know, verbal hiccups. Sarah, you comparing yourself to Caroline Kennedy is like this year's Lions comparing themselves to last year's Patriots. Or a leather couch comparing itself to a steak as something good to munch on. Par example. "I don't think journalists should be anywhere allowed war (sic). I mean, you guys report where our troops are at. You report what's happening day to day. You make a big deal out of it. I think it's asinine. You know, I liked back in World War I and World War II when you'd go to the theater and you'd see your troops on, you know, the screen and everyone would be real excited and happy for them. Now everyone's got an opinion and wants to downer-and down soldiers. You know, American soldiers or Israeli soldiers." Really Joe? So what you want is World War Dos era propaganda films, not reporting. Nevermind that it was embedded reporters showing the carnage and futility in Vietnam who aided in creating a national sentiment, and in hindsight a universally accepted correct sentiment, that we should not have been in Vietnam and the war needed to end? And on the other end of the spectrum, embedded reporters become friendly with the troops, develop repoire, and report favorably on them, not unfavorably. Embedded reporters are good for morale, Joe. That's all for today, I promise to be on top of things this month. Missed your comments and chatter! I agree with you that Caroline was def. treated harshly in the press. But I disagree that she is in any way, shape, or form qualified for the position. Yes, she has a law degree, but she's never practiced. And yes, she is a philanthropist, but that does not a great politician make. Would it kill her to serve in a less, I don't know, substantial role first? ...And that's my two sense. This is the first time I have read your blog. I will have to read more since I think that you and I could have some fun debates. As you may guess from my previous comment, I am an informed conservative, and I am always looking to discuss the issues with an informed liberal. (May I say that they are hard to find..) However, it seems today that we are mostly on the same page. I do not think that Caroline Kennedy's previous work qualifies her to be a Senator, though, I would respect the governor's choice. (A special election would cost a great deal of money.) I have not looked through your other posts, yet, but I am curious as to what you think about the second recovery package. I, for instance, do not always think that a bailout is the way to go. Chapter 11 exists for companies like General Motors to help them get out of cumbersome contracts in order to help them become profitable again. It's good to hear that you and Casey have been reunited. I hope that you get to spend some time together for awhile. Oh, and I wanted to add that I saw the Audrina footage on the Soup last week and I almost peed my pants laughing....Joel McHale rocks my world. Sorry it's taken me awhile to respond to these comments ladies! First, thanks for reading :-) Emily, i am a devotee of your blog too and Kelly if you've got one I'll read it! Anyways, as evidenced by my earlier posts, I agree that Caroline Kennedy is NOT the ideal person to be appointed to the Senate. My point in this more recent post was that Palin's comments that the media has been kind to Kennedy were pretty far off base and again show her obtuse nature in regards to media bias - she's convinced that there's some media conspiracy against her while it was really her own ridiculous comments that repeatedly proved her to be completely incompetent and an entirely unthinking individual. If it's a liberal bias that defeated Palin then I suppose there's a conservative bias hurting Kennedy? Meh - more like a couple of less-than-qualified people making silly comments on T.V. and the media latching on. You reap what you sow!